Click Here to download installation instruction (PDF). 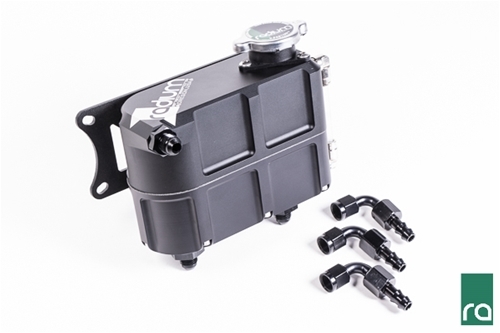 Coolant expansion tanks are necessary for proper air bleeding in applications that utilize a low mounted radiator (such as a V-Mount) or rear mounted radiator. However, expansion tanks are also valuable if integrated in a common radiator setup. To allow heat expansion, traditional coolant systems require air to be present in the top portion of the radiator during low temperatures. An coolant expansion tank permits the radiator to be 100% filled with coolant in all conditions. 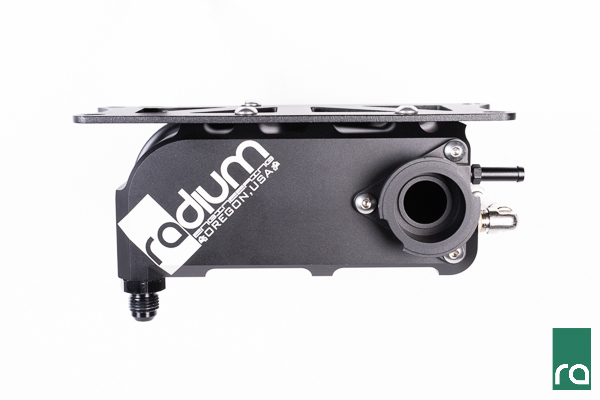 The Radium Coolant Expansion Tank holds 750mL. 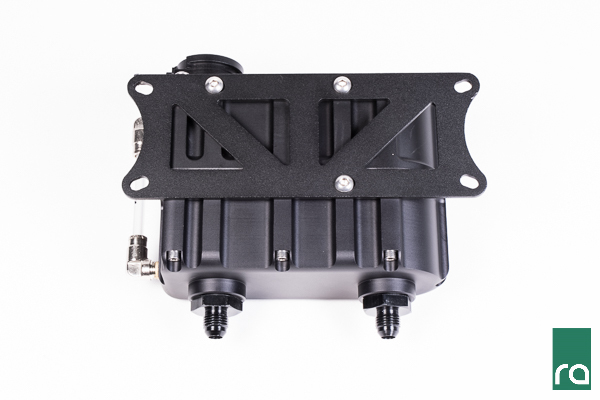 It is a 2-piece design constructed of CNC billet 6061 aluminum. 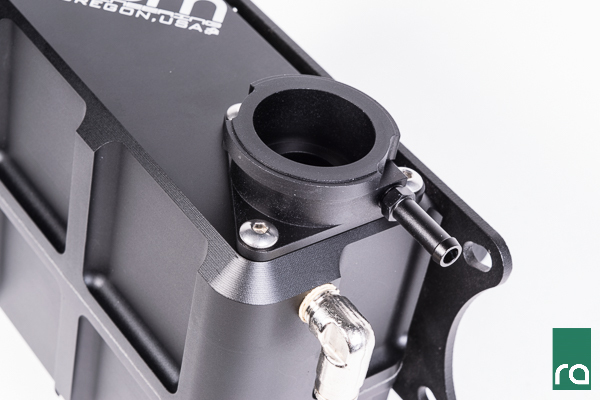 The two halves (shown below) are bolted together along with a CNC billet aluminum radiator neck which accepts a standard 32mm "Mini" style pressure cap. The radiator cap must have a Type-A seal as shown HERE. 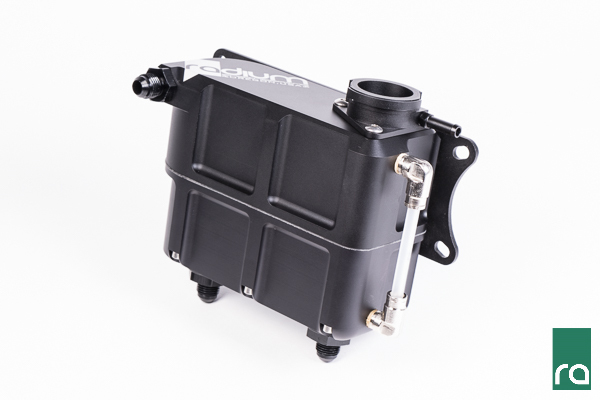 The coolant expansion tank features two internal chambers. These chambers are NOT isolated from each other. There is cross-over passages at the top and bottom. This product is not a coolant overflow tank. Instead, it is designed to part of the pressurized coolant system. 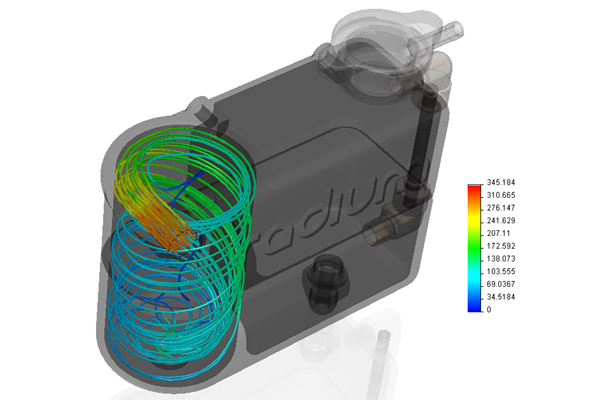 The Radium Engineering coolant header tank also has an internal swirl feature, as shown below. Hot pressurized coolant from the cylinder head is sent into the vortex chamber's inlet tangentially and accelerated to a high rate of rotation. This is to help aid in deaerating the system. The tank features three O-ring boss ports for a positive seal. Included are -6AN male adapter fittings (not tapered pipe threads). The lower ports are machined with 10AN ORB threads. For a list of other 10AN ORB adapter fittings that can be used, go HERE. The side port is machined with 6AN ORB threads. For a list of other 6AN ORB adapter fittings that can be used, go HERE. Included are three -6AN female 90 degree hose ends that screw onto the three -6AN male port fittings. 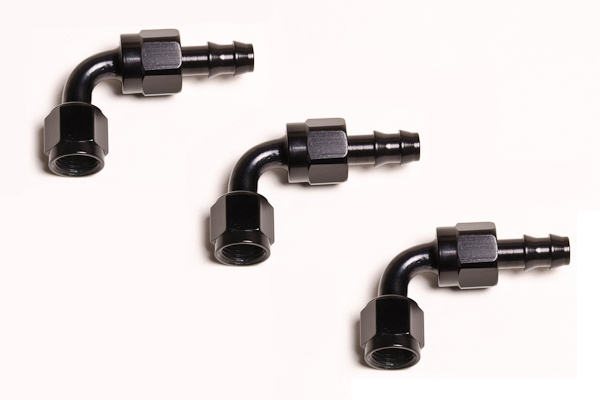 They are lightweight black anodized aluminum and are used for push-lok style 3/8" ID hose. 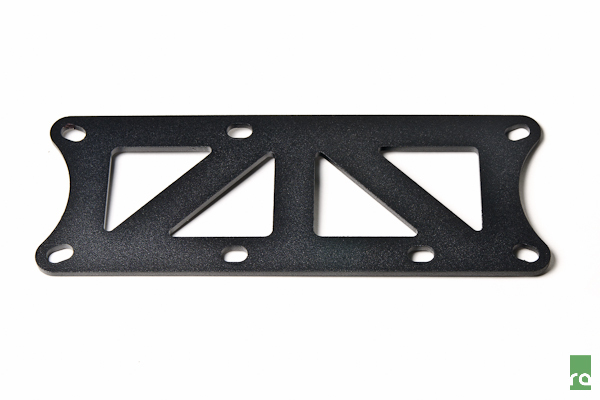 A laser cut black powercoated laser cut mounting bracket is included. See the dimension drawing below. 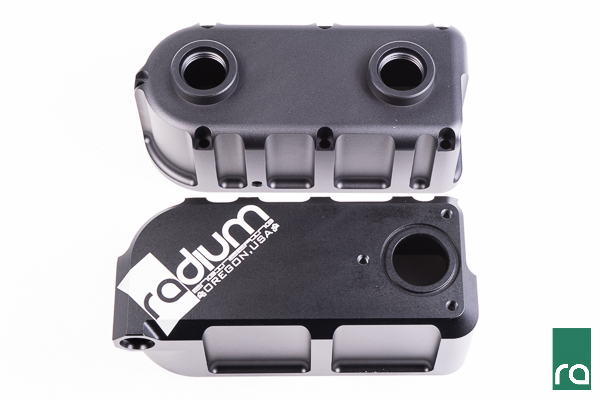 The optional Radium Engineering pressure caps (sold separately) allow the user to select a range of pressure. The purpose of a high pressure cap is to increase the boiling point in the cooling system providing improved cooling efficiency. Each cap is manufactured from stainless steel with a race proven high pressure valve. This is something to consider when tracking the vehicle in extreme conditions. For more information, go HERE.